My work and the accompanying photo at the Townsville T150 Anniversary Celebrations Past in the Present which is on at the Sylvia Ditchburn Fine Art Gallery until 2nd October. 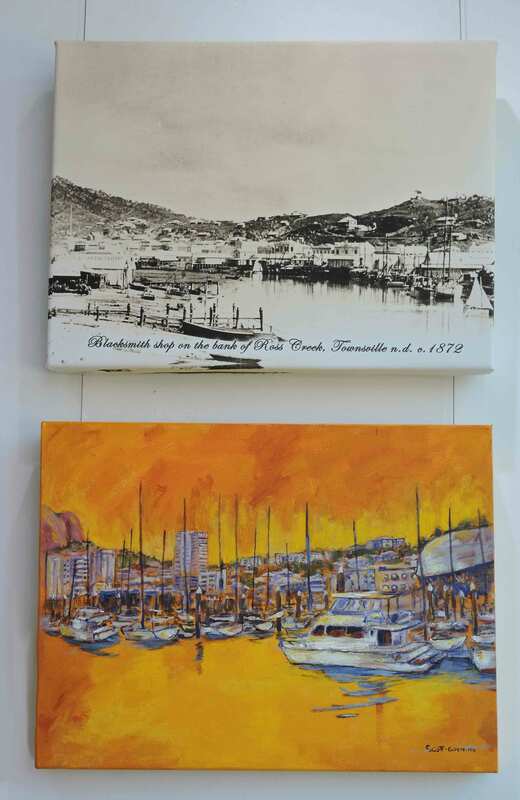 This is an exhibition of heritage photos and current paintings of Townsville scenes. Lynn is a visual artist and writer with over 35 years experience. She has a Master in Creative Arts degree from James Cook University. This entry was posted in Photography, Uncategorized, Visual Art and tagged cultural heritage, Palmer St, Past in the Present, Ross Ck, Sylvia Ditchburn Gallery, T150, Townsville, Townville City Council. Bookmark the permalink. I love your painting, Lynn. Well done! 🙂 That’s one thing I’m missing, not being in Townsville for all the T150 activities, especially as my family were early settlers.